To really put these three-way speakers to the test, we took them out on a number of outdoor live-music events. There are a lot of very nice self-powered portable speakers available these days, but it's always good when something a little different comes along. In this case, it's the three-way, all-active JBL PRX635, which incorporates Dbx speaker-management DSP. I have already used the two-way PRX615M and had been impressed, so I was keen to get these 635s out for a decent road test. The PRX635 uses an integrated amplifier module containing three channels of power amplification (one for each driver), and all the appropriate digital signal processing. The amps themselves are designed by Crown, and all three have an identical output power rating of 500W. The 15-inch driver is a JBL model 265F1, which has a neodymium magnet assembly and features JBL's Differential Drive technology. This uses twin voice coils for increased efficiency and power handling. 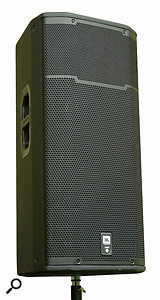 The mid-range driver is a 6.5-inch unit (referred to as a JBL 195H) that is horn-loaded. This driver has a completely sealed chassis and therefore doesn't require a separate acoustic chamber within the overall cabinet. Lastly, the HF compression driver is a one-inch-format JBL 2414H model, which is also found in various other established JBL products, including the VRX928 LA line-array modules. The enclosure is made from 18mm plywood, and covered in JBL's standard 'DuraFlex' finish, which seems to be reasonably scuff-resistant and can be touched up easily enough if the need arises. The slim trapezoidal shape is easy to manage, and the two side handles are large, secure, and have good-sized cup recesses so that the average hand fits in comfortably and safely. At only 27.2kg, the PRX635 is easily moved about by a single person, and is designed to be mounted on a pole or stand, ground-stacked on its low-profile and very effective rubber feet, or suspended using the integral M10 fly points. The cabinet is solidly put together, and I didn't notice any untoward noises when setting it down roughly on a hard surface. The steel grille protects the entire front surface and has a black backing cloth behind it, which looks attractive and also provides a degree of protection against the ingress of dust and small amounts of moisture. The PRX635 communicates with the outside world via a single panel located at the bottom of the amplifier module. It's a nice simple affair with a clear, unfussy layout: there's just a single 'combi' XLR/jack input connector and a direct link output on XLR. The only controls provided are a rotary level control for trimming the input, and a pair of press-button switches that engage a preset EQ boost option. Like the 'loudness' control on a hi-fi amp, this switch increases low and high frequencies by a few dB. Finally, there's an input sensitivity switch for either mic or line input. 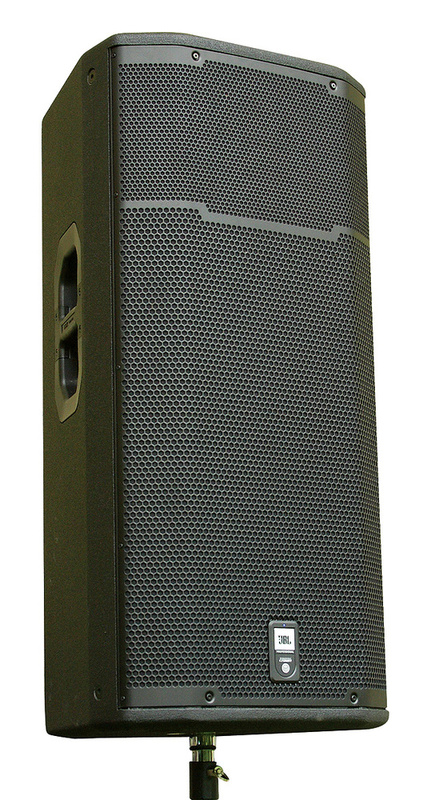 The latter setting allows the PRX635 to be used as a stand-alone PA speaker with a dynamic microphone plugged directly into it. Care needs to be taken to make sure that this switch is in the 'line' position for normal applications, and also that it doesn't get switched accidentally when there's material playing through the system, as this would result in a sudden jump in volume. For this reason, I would prefer not to have this facility at all — I've never ever needed to use it on any 'serious' speaker I've ever owned — or at least have it as inaccessible as possible. A couple of LEDs on the panel indicate signal present (green) and limiter operation (red), and mains power is applied via a standard IEC connector. The DSP tuning all happens behind the scenes, of course, although it's worth noting that the input benefits from the incorporation of a Dbx Type IV limiter algorithm, which is one of the reasons these speakers can be pushed hard with good results. The rear panel houses the input and link-output XLR sockets, as well as an input-sensitivity control, a mic/line input switch, and a button for engaging the preset 'smile' EQ curve. I liked the appearance of the PRX635s as soon as I unpacked them, and I started liking them a lot more as soon as I heard them. Three-way speakers are generally good news, sound-wise, and these did not disappoint. I spent a happy afternoon with my favourite tracks playing while I worked, and I was impressed by the way the sound balance seemed to stay the same whether they were playing at very low or very high output levels. I listened to a range of material, including some heavy orchestral stuff (if you want to check out your mid-range, try the last few bars of the Roman Carnival Overture by Berlioz and turn it up), and various flavours of pop, rock and country, all of which sounded excellent. The room-level sound of these speakers is as good as anything I've ever heard, and they seem very nicely balanced for stand-alone use without external subs, having a nicely defined bass response that is deep and rich without sounding overdone. I then put the 635s into my test system, which has a pair of 18-inch subs running under a crossover of 90Hz, and this unlocked a bit more depth and allowed the 635s to run harder on the rest of the spectrum. I also solo'd various tracks of an uncompressed studio recording, to see how individual instruments would come across and, again, I got excellent, monitor-like results. Because much of the upper mid-range in a two-way system is reproduced by the compression driver, the temptation is often to over-hype things like voice and brass, but with the PRX635 the mid-range is all there, and the crossover at 2.75kHz from the 6.5-inch mid-range speaker to the HF driver sounds natural and smooth. There's no switch-on thump, just a small click as the speaker relays engage, and idling noise is low: these speakers would be fine for audio-visual presentations, as there is no internal fan to produce an annoying whine. The PRX635 is cooled by a large heat-sink area that occupies much of the amp module's surface, and I noticed that this gets hotter than I would have expected, even when the unit is idle. Apparently, this is how these amps are designed to run, however. A man from JBL I contacted a while back about the same observation with the PRX615M described them as 'warm', so presumably they are operating within their normal parameters, but it's definitely uncomfortable to touch this area for more than a few seconds. The first event I took the speakers out on was an outdoor town-centre festival, with many different performers scheduled on stage throughout the day. Interestingly, I'd been asked by the organisers to join them on a BBC local radio interview a few days before to talk about the live-sound aspects, and I remember saying that we were looking forward to the challenge of working with many different types of music. On the day, we had everything from school choirs, a world-class harpist, a classical guitar recital and a young 'rock school' type of heavy metal band, to pop covers bands and just about everything else you could cram into a lively community festival. I must admit I wasn't entirely sure that the single pair of PRX635s would be enough for the job, so I took along some backups (a pair of JBL SRX725 mid/tops and a couple of big power amps) just in case. I was planning to use two JBL SRX718S subs stacked each side, with a PRX635 on top. My Dbx Driverack 260 would feed the main system, and I used a crossover point of 90Hz. When we arrived to set up, we found that the organisers had built elevated wings for the main speakers, which solved the problem of where to stack our cabinets. The stage had been built on ground that sloped downwards quite steeply from stage right to left, and the left-hand stack was therefore quite high up and needed a bit of a human ladder operation to get the cabs in place and secured — all done with due regard for health and safety, of course! The target area was about 40 metres wide by about 60 metres deep, and continuing back as far as the audience were inclined to stand. The ground surface was tarmac, and the site was bounded by buildings set a little way back — in other words, there were going to be lots of reflections. When we'd rigged the system, I put on a test track and wandered around the audience area to listen to how the PRX635s were doing, and I was very happy with both the hi-fi sound quality and the volume level throughout the area. The sound was well-balanced, with nice full bass, and I would have left things there, had one of the crew not pointed out that I was hitting the limiters on the PRX635s. Upon further investigation I discovered that I'd actually connected the Driverack outputs wrongly (in the workshop test rig I have a Driverack PA Plus, and the 'road' one is a model 260, which has configurable output XLRs) so, having plugged everything into the wrong holes, I was feeding HF to the sub amps and a full-range signal to the PRX635s! Once this had been corrected and I'd successfully blamed someone else for the mistake, the system realised its true potential, and I couldn't have been happier with the result. Everything sounded clear, and for vocals and acoustic instruments (of which we had many that day) it was just so easy to achieve a lovely clean sound. One of the most impressive things about the PRX series is the ability to drive the units hard. You have to send some pretty stupid levels to get them to sound rough. These speakers coped with everything we threw at them, and, despite frequent checking, we didn't observe the limiters kicking in at any stage during any of the performances. All live-sound folk appreciate compliments, and I received several. My favourite one was from a guy making a video of a youthful heavy rock band, who said "We were at the O2 the other week...” So I started thinking, "Here we go, he can't hear the guitar or something,” but he continued: "This sounds way better, mate!” and we all went home happy. My second PRX635 outing was the following day, and the venue was a circus-style big-top tent — an enormous thing about 40 metres long erected in a field especially for a day of Jubilee celebrations. As the rig had done such a good job the previous day, I decided to use it unchanged, except that the subs were stacked on the ground and the mid/top units therefore needed elevating by a couple of feet. One of the problems with using three-way speakers is that they have, in the past, tended to be quite large and heavy, not stand-mountable, and needed to be stood on top of something to get the MF and HF exits at a usable working height. The PRX635, however, is light enough to mount on a pole or stand, and I used a couple of short poles screwed into the subs to achieve the height I needed. The programme was just as varied as the day before — perhaps even more so, as we had an operatic soprano soloist accompanied by an organ and a brass section, a local talent show, then a couple of live bands to finish. It was obvious at the band soundchecks that this was going to be quite a loud gig, and I had the backup rig ready to deploy but, again, it wasn't needed. The PRX635s just pumped it out all night, and we still weren't troubling the limiters. The organisers, performers and audience were all more than happy with the quality and sheer amount of the sound. So we rolled on to a third consecutive road-test day, this time another open-air event in a landscaped bowl setting. There were no loud rock bands this time, but another mix of styles and requirements, including vocal harmony groups, steel pans, a 40-strong rock chorus, and even a poet. 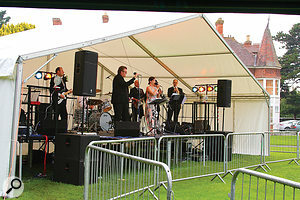 The stage area was a newly constructed concrete plinth with a large acoustic canopy, and the audience area was in ascending grass terraces, with the farthest point about 60 metres from the stage. There was quite a stiff breeze blowing straight across the stage from side to side, which was a constant headache, especially with the rock chorus who, firstly, used loud backing tracks and, secondly, didn't sing directly into the mics as they moved around, but we really got a big sound going with the steel pans, and these three-way speakers really came into their own when the close-harmony vocal group were on stage. This definitely isn't my favourite type of music, but the sound was what I can only describe as lush and sumptuous — full, rich, every voice coming over clearly and with plenty of projection to the top tier of the bowl. I found myself really enjoying the performance. The PRX635s were used at a number of outdoor live-sound events, and on each occasion they performed very well. As you may have guessed by now, I absolutely love the sound of these speakers. I've given them a more thorough road test than usual, and at times administered a 'damn good thrashing' over a run of decent-size gigs. I even went along to the new demo facility at Sound Technology (who represent JBL and other Harman Group products in the UK), where they have most of the JBL range of flown and stacked systems all rigged up and tuned. It was, of course, immense fun to play with all this lovely hardware, but what I found most interesting was that a pair of PRX635 speakers on stands, without subs, sounded almost identical, at moderate levels, to an adjacent VRX728/VRX915 line-array rig, being perhaps just a little bit more 'forward' in the mid range. I'd say that they'd be a hard act to follow for sheer versatility, and I'd be very happy to use them for all the gigs in my diary, apart from the larger outdoor events, where I'd go to a line array or hire in something altogether bigger. I still have a slight concern about their normal operating temperature, although to be fair I didn't experience any problems whatsoever, and I ran these units very hard for many hours at a time, albeit not in high ambient temperatures. I did try experimenting (at a fourth gig, not recounted here but just as successful as the others) with a fan pointing at the back of the cabinet, and after a night of loud soul covers, the heat-sink area was perfectly cool, so for hot days I'd be tempted to take the fans along. Of course, it goes without saying that you should protect active speakers from direct sunlight as a matter of course. The JBL PRX635 is a very versatile portable active speaker, and delivers really great sound, with plenty of output available when needed without compromising the quality. It is compact and light enough to be safely and easily pole- or stand-mounted, and worthy of serious consideration for just about any medium-sized application you could think of. Indeed, after working with these speakers for this review, I like them so much that I have ordered four for my own inventory! 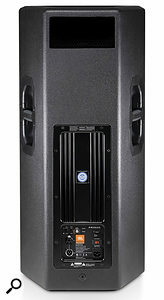 Obvious alternatives include the QSC KW153, the Mackie HD1531 and RCF's 4Pro 6001A. Lovely, well-balanced, refined sound from this three-way design. Very portable and easy to handle. Capable of operating cleanly at high output levels. 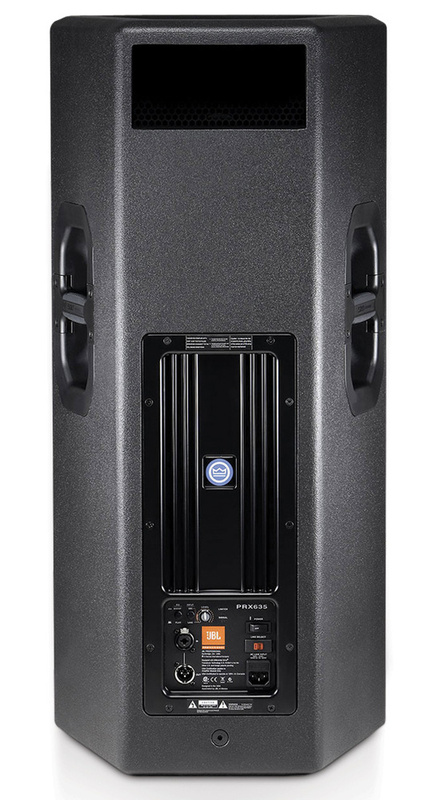 A highly accomplished PA speaker that ticks pretty much all the boxes for medium-sized applications. Recommended! £1458 per speaker, including VAT. Sound Technology +44 (0)1480 480000. Harman +1 818 894 8850.